The Brawler™ FULL Width Front Bumper for JK provides the highest ground and tire clearance possible in a full width JK bumper. This bumper brings Poison Spyder form and function to the overlander market, and to those who would like to keep their stock JK fender flares. The bumper extends to the full width of the stock flares, to integrate with them cleanly while protecting them from trail hazards. This configuration includes recessed fog light buckets and high clearance recovery shackle tabs. 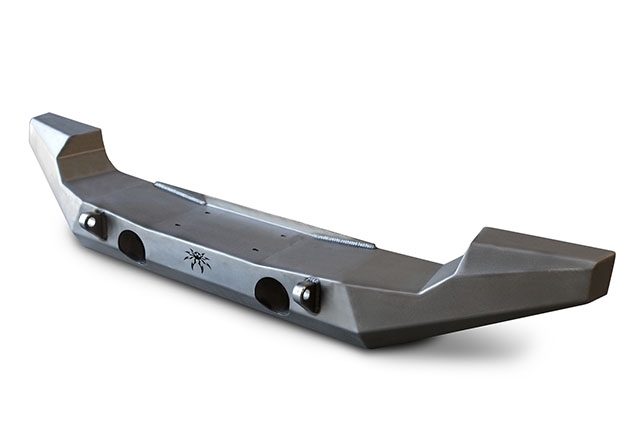 Like all bumpers in the Brawler product line, the FULL Width is fabricated from 3/16" plate steel, CNC laser-cut and precision brake-formed into a low profile, high clearance design. This product ships as bare steel—it will need to be painted or powder coated prior to final installation. We do not yet offer a powder coat option for this item. The Brawler™ FULL Width Front Bumper is designed to accept most Warn winches, and winches from other manufacturers that conform to Warn's standardized winch mounting dimensions. The winch sits in a slight depression on the top surface of the bumper, with plenty of CNC laser cut plate steel gusseting inside the bumper shell, directly underneath the winch to provide maximum strength. The Winch Fairlead Mount (p/n 45-57-010) is sold separately, so that those who wish to not run a winch are left with a clean looking, unobstructed top surface on their bumper. IMPORTANT: installing the Warn ZEON winch on the Brawler MID Front Bumper requires a set of our ZEON Winch Spacer Plates (p/n 45-57-010-03). A separate version of the Brawler™ FULL Width Front Bumper is available with the DOM tubular "Brawler Bar". The Brawler™ FULL Width Front Bumper comes to you as bare steel, ready to accept paint or powder coat in the color of your choice. A powder coat option for this item is not currently available directly through Poison Spyder. See your nearest Poison Spyder dealer for powder coating options through a coating shop near you.